I tucked into a rather naughty Afternoon Tea for my birthday as a treat a few weeks ago. Being fully aware that I would break with the Keto lifestyle for the weekend in advance helped somewhat with the feelings of guilt. Jumping back was very easy on the Monday and I am glad I did afford myself the break. Oddly enough though, it did make me realise that I do not miss cake. Don’t get me wrong, the Afternoon Tea was absolutely amazing, but I realised I miss the texture more than the taste. My normal go-to dessert treat is strawberries and cream, but there is something about a cake/ rock cake/ biscuit texture that I miss. With this in mind, I went on the hunt for a recipe that would satisfy my cravings and found one easily in the Coulter’s Nutrition UK (keto support and recipes) group. Managed by Steph, the group is awash with lots of Keto information, tips and most importantly recipes! I have tweaked the recipe somewhat as I used ground almonds as opposed to almond flour, which you can pick up in Home Bargains, Aldi etc. It’s very easy to simply place ground almonds into a food processor to blitz them up finer, but I just go with the flow. I’m not the hugest fan of the taste of ground almonds in place of normal flour – they can come across as more stodgy. However with my second attempt at the blueberry keto cake, I used less! As for the sweetener, I used Natvia which I purchased in Tesco. This recipe really is just a case of combining all the ingredients into the same bowl and making a mixture that would be considered cake like. It’s a very easy and simple to make recipe, with most ingredients no doubt already to hand. Which is why you will be seeing an image of the baked cake in the tin from my first try… I may have overcooked the tray attempt slightly! As you can see from the image below, the cake has an almost ‘crumble’ effect texture… the texture I have been missing! Let it cool slightly and serve with some double cream! It doesn’t have that sweetness as a normal cake, but that is to be expected when using a stevia based sweetener on a Keto diet. Allowing the cake to cool and smothering in cream made the Keto Blueberry Cake really enjoyable. It’s all about trial and error and I am sure more experienced bakers wouldn’t have allowed their cake to overcook like I did, but I will know for next time! 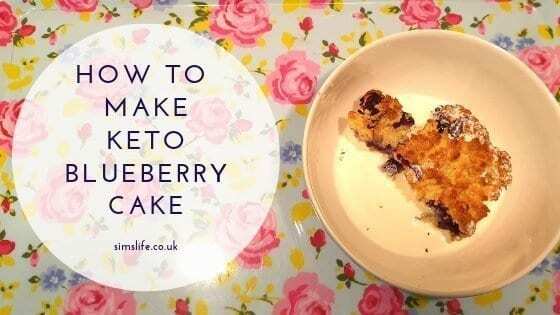 Check out more Sim’s Life Keto recipes, for simple and quick food to make on the lifestyle!